Thanks for the wishes. The Auntie had a great day out and we threw a few soft plastics here and there as we past feeding fish. They were not feeding aggressively but l still just like seeing them. 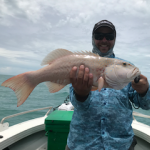 The wife wanted to catch a fish so we stopped over a small reef and got a gold spot cod, released. Ovington, you Sir, are a deadset legend! Keep casting mate! Only a matter of time until that big, mean, prehistoric, thug turns up! Gee Whiz I love GT's!!! This 1 was probably around the 15kg mark. That gash on the side is where a true behemoth GT grabbed him during the fight. He grabbed it and took off... reel started screaming and I thought "here we go" but then he dropped it. it wasnt to be. I reckon He was well over 50kg. maybe 60. That was on a Saragosa 20k with 80lb powerpro and a Tcurve GT special. It was the first time it had ever been tested out. Ive caught 10kg+ kingies on it and 1m spotties and they felt like whiting haha! Dont "think" about getting that bigger rig mate. If you dont have it when the big daddy turns up you could possibly regret it for the rest of your life! So they have both turned up now. The Catfish grew a bit. It was supposed to be a 3m version. This one is a Beast. Cracking prizes. Get on it!!! I can clearly remember my first fish. My mum and dad and six of my brothers and sisters (another six were to follow in later years) were on the homeward leg of a caravanning adventure to Melbourne and back. Hard to imagine now having 8 humans in an old Humber sedan towing a van all that way and not being arrested or killing each other. Anyway, we stopped in at the caravan park at Currumbin on the way home and my dad let me have a go with his cork hand line spooled with that old green fishing cord. I was six years old at the time in 1961 (hence the “old” in Old Scaley). I can’t remember what I was using for bait but I clearly remember running backwards up the sandy beach on Currumbin Creek to skulldrag a tiny whiting to dry land. The thrill of that capture never left me and I still get the same feeling today on the rare occasion that I catch a fish. Being from such a big family there wasn’t much time or money to indulge any one child in their preferred hobby but I was lucky enough to be sent to Amity Point to spend most of my holidays with relatives who were early settlers there. I spent many an hour with a handline on the old jetty catching butter bream using dough my great uncle made up for me. Then I was allowed to cook some on a small fire on the beach in front of the house for breakfast or lunch. 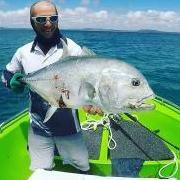 Occasionally I got to go out in Rainbow Channel with the men and catch some amazing reefies like parrot and sweetlip, or to run around on the Nash banks at low tide filling a sugar bag with spanner crabs that were then cooked up in an old copper to be eaten later around a campfire on the beach. Happy days indeed. Heres a few more pics from the dad and mates visit. Unfortunately not much boat time but a few pbs for them still.